Here is a humble no-nonsense everyday dal to conclude this 'No Onion No Garlic' series. I am surprised that I haven't posted this everyday dal here. The above platter includes Palak Dal, Rice, Roti, Tomato Koora, Yogurt, Roasted Carrots and Rice Kheer. The process I used here can be simulated in a pressure cooker as well. Before I acquired the Instant Pot, I used to follow the same process in the pressure cooker. Some people like the tempering/seasoning after the dal is cooked and ready to be served. So adjust accordingly. To recap the dishes I posted under this series..
Gently clean the leaves well and chop. Wash Toor dal and set aside. Once the display changes to 'Hot', add oil, mustard seeds, urad dal, cumin seeds, asafotida and curry leaves. After the cumin seeds crackle, add the spinach. Saute for a minute. Add in the washed dal, turmeric, chopped green chilies, tamarind juice if using and salt. Add about 3 cups of water. I cook rice along with it by placing the trivet into the dal, wash rice in a separate steel container and place it on the trivet. Put the lid on, set the vent to sealing. Set it to 'Manual' or 'Pressure Cook' for 10 minutes. After the Instant Pot does the magic, wait until the pressure is released naturally. unplug the Instant Pot. Remove the container with the cooked rice, remove the trivet and transfer the dal into a serving container. Squeeze in the lemon juice (if tamarind juice has not been added) into the dal and serve over hot rice and ghee. Palak dal is my favorite and i make the same way as you mentioned. Palak dal looks delicious and it makes great pair with both rice and roti !!! That is one comforting and homey thali you got there Harini. Spinach dal is an all time favorite and your version looks absolutely delicious. Dal and Sambar are the two dishes I add spinach to and it increases the dish's taste a lot. Love your mini thali so much.. Very comforting dal, and i love this sort of green based dal. Fingerlicking goodness definitely. Seriously drooling here. Always love spinach with dals ,it makes my meal time fantastic .. Such a delicious platter..
We normally use Channa Daal to spinach and adding toor daal sounds interesting . The daal looks delicious , simple ,yet flavourful . All your dishes under no onion no garlic totally rocked ! Love this typical home style dal, Harini. My kids and I never get bored of spinach. Love your meal Harini and you are rocking with all your IP dishes, everything looks amazing, your roasted carrot is interesting! Palak dal is an all time favorite in our home. Anytime I run out of ideas what kind of dal to make hubby will say make dal palak. This is such a healthy and amazing comfort food :) I love the entire platter, such a wholesome meal to indulge harini.. The the palak dal is perfect to enjoy any time, looks so yummy !! Such a simple and comforting recipe Harini! I usually add moong/masoor along with toor, hot rice and some dal and ghee is one of the best comfort food in the world ! The whole platter looks very delicious Harini. ITs a long time since I made this dal palak and whenever I do, I avoid onions. Will make this version next time. My little one loves anything green and palak dal and palak rice are two of his favorite. Love how comforting that dal would be with a bowl of steaming hot rice and some ghee. 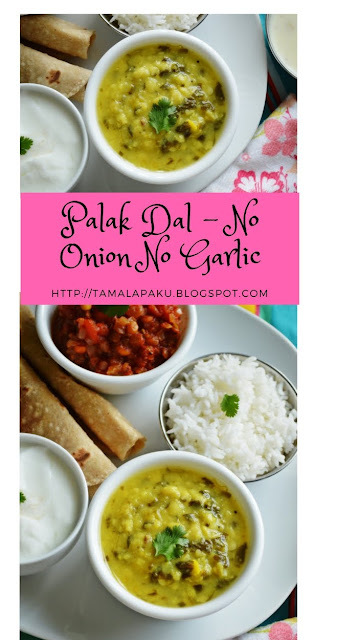 Love this simple and comforting no onion garlic palak dal. I can finish it all with some garma garam hot chapatis. Very healthy and comforting dal recipe.